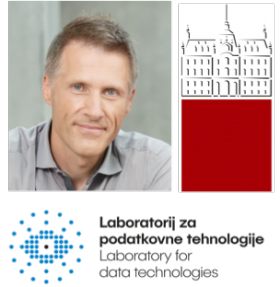 I am a Full Professor (2014 – ) and the Head of the Laboratory for Data Technologies (2009 – ) and IoT Demo Center (2015 – ) at the Faculty of Computer & Information Science, University of Ljubljana. From 2013 to 2016 I also served as a vice-dean for Economic Affairs. At my heart, I am a Software Engineer. In the last 20 years, I have spent a lot of time working with software companies and institutions with large IT departments. I was focused on IT Governance, specifically IT/IS Strategy Planning and Software Process Improvement. I worked on a number of projects related to this matter. This shaped my research and helped me to stay in touch with practice. In 2006, I shifted with the establishment of a new research group focused on data analysis, specifically anomaly and fraud detection for telcos and health insurance companies. In 2008, we established a spin off Optilab, which specializes for Fraud Detection in Health and Motor Insurance. In the lab, we do research on basic areas of data acquisition, presentation, analysis and visualization (specifically network analysis and information retreival), but also strive to find connections with the Software Engineering field and problems that arose from there. Lately, a special focus has been dedicated to the area of the Internet of Things (IoT). We have established an IoT Demo Center that specializes for various domains of the IoT.